The Port of Lowestoft is a harbour in Lowestoft in the English county of Suffolk owned by Associated British Ports. It is the most easterly harbour in the United Kingdom and has direct sea access to the North Sea. The harbour is made up of two sections divided by a bascule bridge. The inner harbour is formed by Lake Lothing whilst the outer harbour is constructed from breakwaters. Traditionally the harbour was the site for an extensive fishing industry as well as engineering and shipbuilding companies such as Brooke Marine, Richards and Boulton and Paul. The offshore oil and gas industry has also operated from the harbour with Shell maintaining their Southern Operations base in the harbour from the mid-1960s until 2003. Although the offshore industry remains important, many of these industries have now declined substantially. In the modern era the port is attempting to develop as a focus for the renewable energy sector. The harbour is the focus for redevelopment proposals for Lowestoft in the form of the Lake Lothing and Outer Harbour Area Action Plan submitted in February 2011. The plan focusses on the redevelopment of brownfield sites in and around the harbour area to create jobs, particularly in the renewable energy and retailing sectors. The harbour in the 1930s. The harbour was originally built by the Lowestoft and Norwich Navigation Company and developed by the Norfolk Railway following the construction of the Norwich to Lowestoft railway. The original Inner Harbour was constructed in 1831 when the Lake Lothing joined to the sea, as shown on a chart based on a survey by William Hewett, Commander of HMS Fairy dated 1834 and the Outer Harbour in 1937. 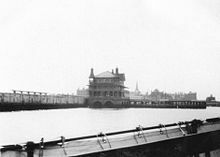 The railway line ran alongside the north side of the docks and a series of docks railway sidings were used mainly for fishing and freight wagons. These lines have mainly been removed from service but in places sections of the track can still be seen. The development of the harbour led to a rapid growth in the fishing industry and associated engineering and ship building companies such as Brooke Marine, Richards and Boulton and Paul. Large scale ship building, which included the building of vessels for the Royal Navy, continued into the 1980s. The fishing heritage of the harbour is celebrated through the museum ship Mincarlo which is usually berthed in the yacht harbour during the summer. The harbour was used as a naval base during World War I and World War II, particularly for the operation of auxiliary vessels, including armed trawlers such as Nelson and Ethel & Millie which were used to combat enemy U-boat action in the North Sea. The Royal Naval Patrol Service had its central depot in Lowestoft during World War II and a total of five naval bases were established in the town, primarily for minesweeping and coastal defence duties. The port's main entrance can accommodate vessels up to 35 metres in width, with vessels 22 metres wide being able to access the inner harbour through the Bascule Bridge. The harbour is able to service vessels up to 125 metres in length. Modern transit sheds and a 14,000 tonne silo are available with a range of cranes and other facilities including a container terminal. There are also facilities for ship repairs, including a dry dock and a number of slipways. Mutford Lock links the inner harbour to Oulton Broad from where Oulton Dyke provides access to the River Waveney and Broads system. Lowestoft Lifeboat Station is located at the mouth of the outer harbour. The harbour remains the site of Lowestoft fish market, although by 2011 only three traders remained. The long-term future of the fish market is under threat as the port seeks to redevelop. The port remains a centre for the oil and gas industries in the southern North Sea, including the construction of oil and gas platforms. It is attempting to develop as a centre for renewable energy within East Anglia, including the construction of wind turbines and developing tidal and wave power. Some ship building and repair still goes on in the harbour. The port stores emergency response equipment in case of an oil spill off the Suffolk coast resulting from ship to ship oil transfers. The harbour is also a centre for the leisure industry with a yacht harbour and marina. ^ Lowestoft, Poppyland Publishing. Retrieved 2011-04-30. ^ a b Offshore industry timeline, Great Yarmouth Council. Retrieved 2011-04-21. ^ An introduction to the Area Action Plan for Central Lowestoft Archived 19 July 2011 at the Wayback Machine, Waveney District Council. Retrieved 2011-04-30. ^ What is the Area Action Plan? Archived 19 July 2011 at the Wayback Machine, Waveney District Council. Retrieved 2011-04-30. ^ Mace. H (2010) Vision for future of Lowestoft harbour, Eastern Daily Press, 2010-10-14. Retrieved 2011-04-30. ^ a b Port of Lowestoft Archived 22 July 2011 at the Wayback Machine, Lowestoft Maritime Museum, February 2011. Retrieved 2011-04-15. ^ maritimemuseum. "Early Charts". Lowestoft Maritime Museum. Retrieved 24 February 2014. ^ Brooke Marine, Ocean Pirate. Retrieved 2011-04-25. ^ Mincarlo - A Lowestoft Sidewinder Archived 17 July 2011 at the Wayback Machine, Lydia Eva & Mincarlo Charitable Trust. Retrieved 2011-04-21. ^ RNPS history, Royal Naval Patrol Service Association. Retrieved 2011-05-21. ^ a b c Port of Lowestoft - facilities, Associated British Ports. Retrieved 2011-04-30. ^ a b Port of Lowestoft - commodities, Associated British Ports. Retrieved 2011-04-30. ^ Small & Co. (Marine Engineering) Ltd. Retrieved 2011-04-30. ^ Fears for future of Lowestoft fish market, BBC news website, 2011-03-11. Retrieved 2011-04-09. ^ Port of Lowestoft, Associated British Ports. Retrieved 2011-04-30. ^ End of an era beckons for Lowestoft fish market, Eastern Daily Press, 2011-03-29. Retrieved 2011-04-30. ^ Great Yarmouth and Waveney March 2010 Archived 23 March 2012 at the Wayback Machine, Shaping Norfolk's Future, March 2010. Retrieved 2011-04-21. ^ Lowestoft delivers gas platform, associated British Ports, 2000-05-11. Retrieved 2011-04-21. ^ Suffolk firm's wave energy machine gets backing BBC news website, 2011-02-02. Retrieved 2011-04-21. ^ Wave power machine tested on land, BBC news website, 2010-11-10. Retrieved 2011-04-21. ^ SLP Engineering Lowestoft Off Shore Industry. Retrieved 2011-04-30. ^ About AKD, AKD Engineering. Retrieved 2011-04-30. ^ 'Oldest' steamship gets £2m refit, BBC news website, 2008-06-28. Retrieved 2011-04-21. ^ New start for grand old lady, BBC Suffolk, 2008. Retrieved 2011-04-21. ^ Southwold: Bid to ease oil tanker spill fears, East Anglian Daily Times, 2011-01-27. Retrieved 2011-04-30. ^ Lowestoft Haven Marina. Retrieved 2011-04-30. ^ The RNSYC Marina Lowestoft Royal Norfolk and Suffolk Yacht Club. Retrieved 2011-04-30. Wikimedia Commons has media related to Port of Lowestoft.